In our printer reviews for you, we’ve been focusing extensively colour printers till now. We haven’t really reviewed a purely monochrome laser printer for you. That’s about to change because this will be the first such review. 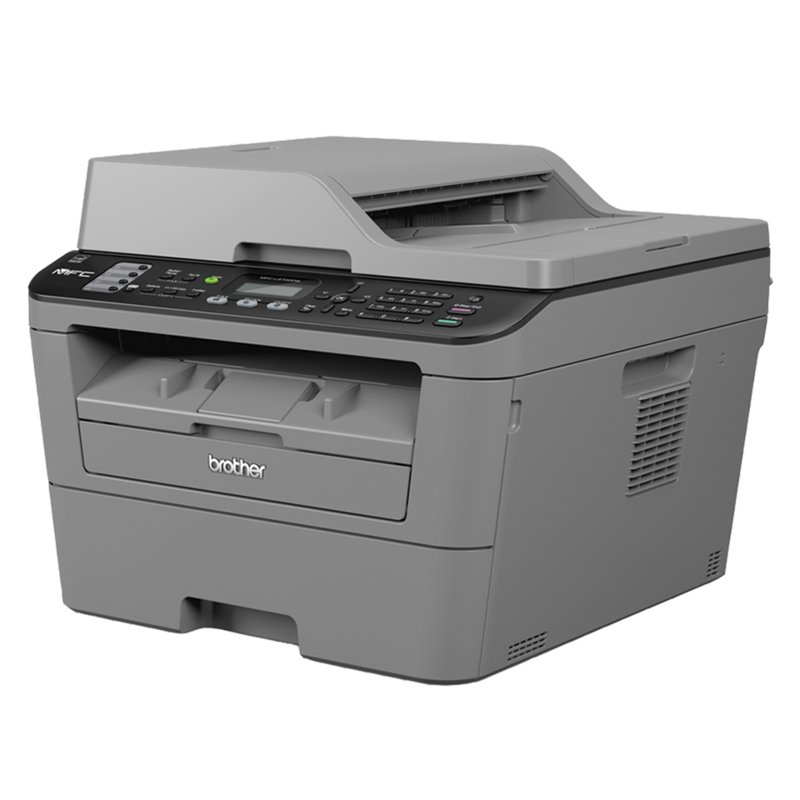 Our object of attention today is going to be the Brother MFC-L2700DW laser printer. 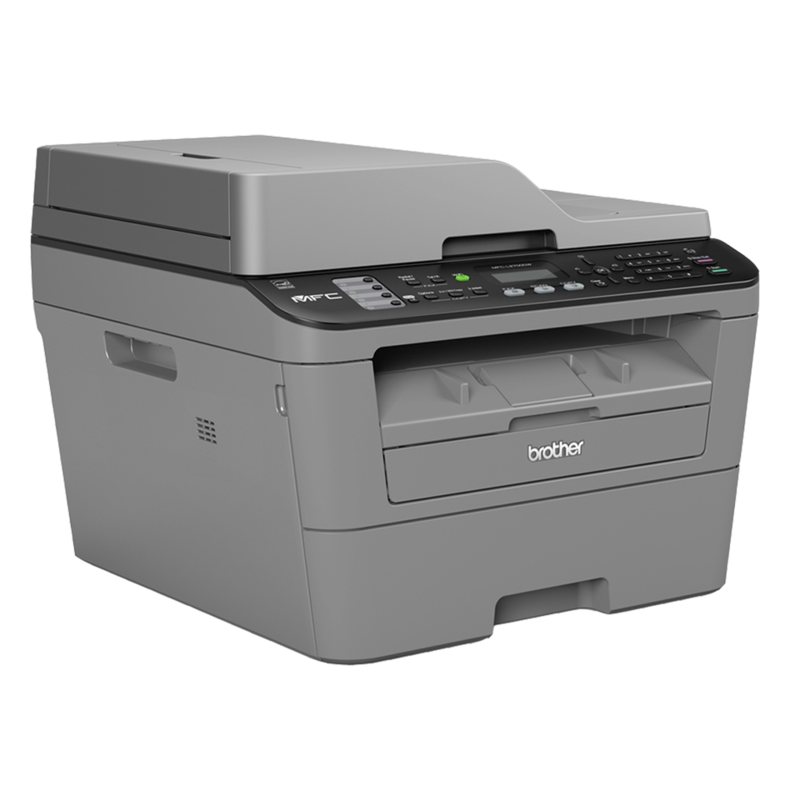 The Brother MFC-L2700DW is actually an all-in-one printer that is supposed to be ideal for business use. This is evident from the fact that this printer is a part of Brother’s business printer line-up and has a stoic gun metal grey finish supplemented with a little black. The set of features that this printer boasts of also suggests business use. However, sizes and capacities of this device mean that it is only useful for smaller offices and workgroups. At the same time, its small size enables it to be useful for heavy home users too. So, what are the positives and negatives of the Brother MFC-L2700DW all-in-one printer? Let’s find out. The obvious strength of the Brother MFC-L2700DW is that it is an all-one-printer. This means that you get faxing, copying, scanning, and printing capabilities all in one device. This is obviously a boon, but it is a boon that many businesses and professionals take for granted these days. So, it might be better for us to quickly move onto a more significant strength. The Brother MFC-L2700DW all-in-one printer is economy personified. This device isn’t only cheap to get but also cheap to run, especially with its high yield cartridges. This economy really starts telling if you get generic toner cartridges from a reliable provider since Original Equipment Manufacturer (OEM) cartridges are almost always more expensive than generic toner cartridges. Typically, with OEM toner cartridges, your per page cost will come out to about 6.6 cents but with generic toner cartridges it will drop down to only 5 cents. Economical printers usually compromise on the feature side of things. However, that isn’t really the case with the Brother MFC-L2700DW all-in-one printer. Barring the obvious absence of colour printing, this printer really does offer quite a few features. 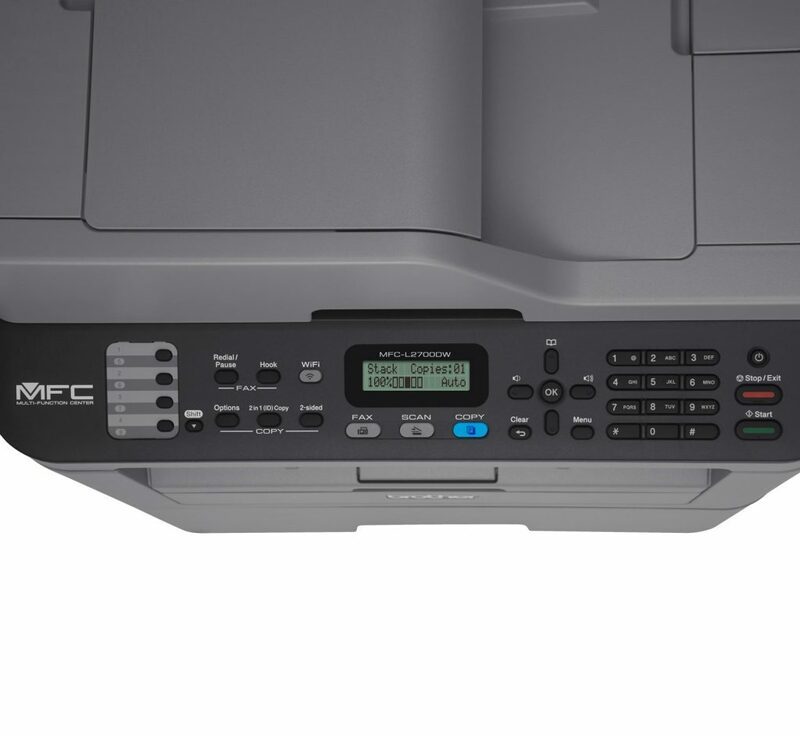 The foremost of these is the Automatic Document Feeder (ADF). This is a feature that even some of the higher end all-in-one and multifunction printers don’t possess. In this device, the ADF supports a flatbed that can handle letter sized documents. Needless to say, the ADF itself can handle legal sized sheets. Then, there is also the automatic duplexer that is not as common as it should be in devices intended for business use. 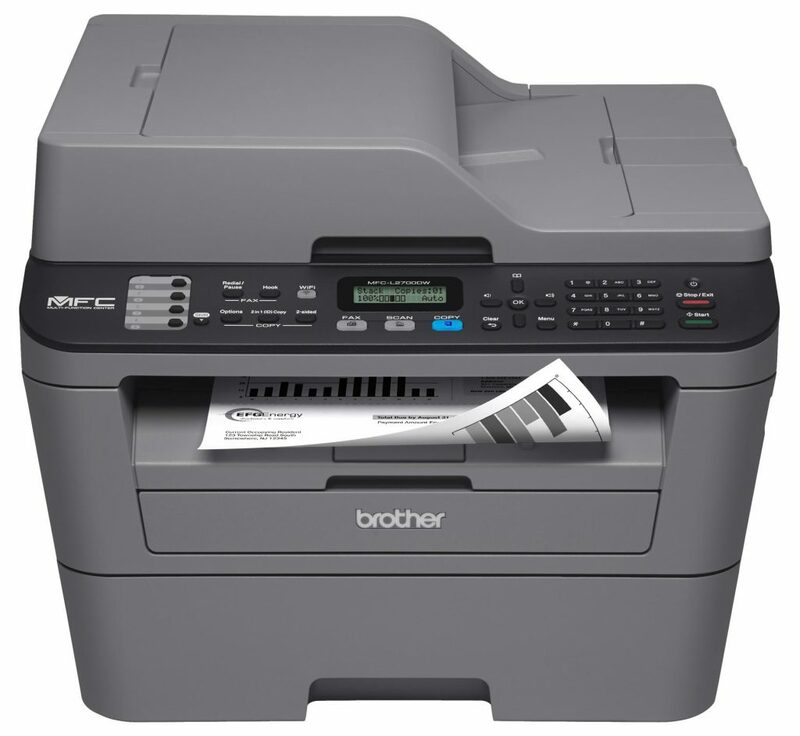 Just to clarify, the Brother MFC-L2700DW all-in-one printer has one. A feature that is becoming increasingly common in printers these days is Wi-Fi direct connectivity. This feature is available in the Brother MFC-L2700DW all-in-one printer as well along with other usual suspects like USB 2.0 and Ethernet. Finally, it is worth mentioning that the OEM has managed to provide all these features without letting its device grow into inordinate sizes. This is a compact machine that you can comfortably put on your desk. It spans 409mm x 398.5mm x 316.5mm. The greatest weakness of laser printers is their output quality. Even the best business laser printers can’t hold up a candle to the output quality of business inkjet printers. With that in mind, the output quality of the Brother MFC-L2700DW all-in-one printer is even lower than most other business laser printers. In other words, if there was a spectrum of business laser printer output quality; Brother MFC-L2700DW’s overall output would fall in the lower bands. This is largely due to its poor graphics and photo output quality, which isn’t something you can expect to be great with a monochrome laser printer in the first place. If your intention is to only use this device for printing text documents, then you shouldn’t face too many problems because the quality is stable there. There’s one more minor flaw of this printer that you should be prepared for. While the Brother MFC-L2700DW all-in-one printer boasts of an LCD screen, the display of that LCD screen is simply atrocious. Either you place the printer in a well-lit area with light right on top of the display or you forget about reading the LCD screen entirely. As you can see from the above, the Brother MFC-L2700DW is all about speed and paper handling. In other words, it is about volume printing especially if you consider its low per page cost. The speed is an intrinsic part of this characteristic of this printer. The rated speed of the Brother MFC-L2700DW all-in-one printer is 26 pages per minute (ppm) which is on par with the best specimens in its segment. The other side of this characteristic is paper capacity. The total paper capacity of this all-in-one printer is 286 sheets. Of these 286 sheet total capacity, the input tray accounts for 250 sheets, the ADF accounts for 35 sheets, and the manual feed accounts for one sheet. While this paper capacity should be more than enough for most small businesses and high volume individual users, there aren’t any add-on options if you want to increase it. With respect to resolution, we would be very surprised if any of you is interested in this printer for its output quality. Still, if you are, the maximum resolution that this monochrome laser all-in-one printer is capable of is 2400 x 600 dots per inch (dpi). From the perspective of connectivity, as explained above, we have no qualms recommending the Brother MFC-L2700DW to you. This printer supports mobile printing and cloud printing both. On top of the printer in black, you’ll find the offending LCD screen spanning nearly 51mm. This screen is supplemented by a series of navigation buttons for faxing, scanning, and copying. The software behind the screen also allows for one button customisable series of fax and telephone numbers.